I am not a gamer, nor do I play one on TV. That said, in my day job I write a lot of code, type reports, message data and perform all manner of keyboard-related activities. It is important to have a comfortable, responsive and well-designed keyboard, so most people in my profession tend to go for mechanical gaming keyboards because they more than meet the stringent requirements. Not all gaming keyboards are made equal, however. Does the VAVA keyboard have what it takes to satisfy this code monkey? Let’s find out! I started off in the computer business working on IBM mainframes. That was the birthplace of the mechanical keyboard, and for a very long time, no one did it better than the IBM System 370 keyboard that was transplanted to the first IBM personal computer. Over time, though, others have taken the ball and run with it – notably manufacturers like Das Keyboard and Corsair. Today, there are a wealth of mechanical keyboards – some proudly carry on the IBM tradition while others can only look in the window and hope to be that good. So what makes a good keyboard? First and foremost, the feel of the keys on your fingertips as you type. Too slick and you make lots of typos. Too rough and you lose speed as your fingers drag across the keys. A good keycap with an anti-slip coating is an absolute necessity if you want to outlast the ogre in battle or your boring manager Bob. Next up, the key switch itself: membrane-style keyboards just feel mushy and do not provide a lot of tactile feedback, the kind necessary for the muscle memory that lets you know you pressed the key. Mechanical keys provide that kind of feedback. Finally, a good backlight on the keys, because most gaming and coding take place in darkened rooms. Something that lets you know the keyboard is there without appearing like a spotlight shining in the corner of your eye. 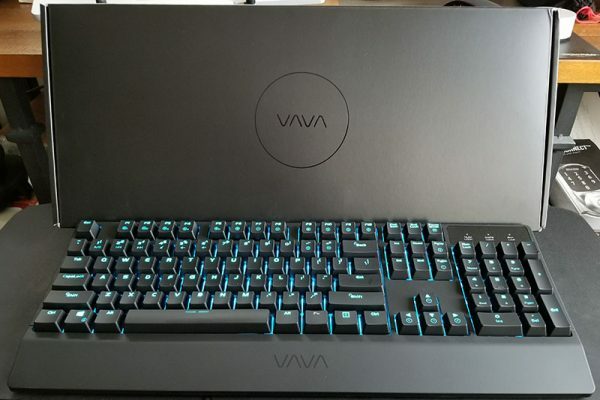 Unboxing the VAVA keyboard you are immediately greeted with a solidly built product. It has the right “heft” – not too heavy, but substantial enough not to move around willy-nilly on your desk. As you unbundle the USB cable connected to the keyboard you will find a welcome surprise – a connector cable that can manage to power the backlight with a single USB connector. Far too many keyboards require 2 USB connections, one to handle the keystrokes and the other to power the lighted keys. The out of the box lighting mode for the keyboard is a wave-like light changing effect. This stock photo from VAVA gives you an idea – color-changing waves roll across your keyboard. An interesting effect to be sure, and probably great for an in-store demo but probably not what you would want for everyday use. It is easy to miss the instruction card as it sits at the very bottom of the box below even the side supports for the keyboard. This thin piece of paper has the instructions on how to change the lighting effects to something you can live with day to day. In addition to the default ripple mode, there are snake, starlight and breathing modes which have various effects. Again, interesting options for a demo, but probably not what you would want in everyday operation. There is also an option for fully lit mode – this is how I run, with a nice cyan backlight. Maybe of more interest, though, is a custom mode that allows you to set up each key individually. For example, you can set the numeric keypad to glow red, the direction arrows and page up/down to be green, the function keys yellow and main body of the keyboard cyan. This custom mode is retained when power is off, so you can pretty much set it as you like and then forget it until you want to change. Be warned, though, that creating a custom configuration can be a tiring process as you must press each key multiple times to arrive at the color you would like. Cyan, for example, is the sixth color in the cycle, so in order to customize to this color, you would have to press each key 6 times. That is a lot of keystrokes on a 104-key keyboard. The keyboard itself has all the right moves. The keycaps have the right amount of stickiness so you know when you have pressed a key and your fingertips can quickly move to the next key. The travel distance for each key is perfect for touch typists, and the keys immediately spring back into position. The keys use the blue key switch which is rated for millions of key presses – but more importantly, it is a rapid-fire switch which reduces ghosting (when you press multiple keys simultaneously but one or more keys are not registered – usually a sign of a switch on a key which blocks the other switches from registering because of the length of time it takes to register the press) and can keep up with the fastest typists. A hallmark of the mechanical keyboard is the “clicky” sound it makes, and the VAVA keyboard lives up to the standard. It makes an obvious sound but thankfully there appear to be dampeners which mute it more than most. In our home office my wife and I sit about 10 feet apart, and in the past, she has complained that my typing sounds like a woodpecker on speed. She has definitely noticed a change since I have been using the VAVA keyboard – the sound isn’t gone, but she can live with it. The experience in your office may vary. Where the rubber meets the road is in pricing. A great mechanical keyboard can cost a couple of hundred dollars, and even the so-so ones can be over $100. In my use case, the VAVA is on the upper end as far as functionality and features go, yet the retail price is $79.95. Very definitely a bargain. Is this keyboard for everyone? No. If you are a light computer user, a less expensive membrane style might be all you need. And if you really want wireless peripherals, you will have to look elsewhere. But if you type for a living for fun, this is one of the best available keyboards, and the price should help move it to the top of your list. With the holidays coming up, this might be a great gift for the code monkey on your list. Source: The sample for this review was provided by VAVA. Please visit their site for more information and Amazon to order one or to get additional reviews. The second USB plug usually is for a pass through port actually. What’s the difference between this one and the $49.99 one linked to at Amazon? Those Backlit Keyboards are pretty beautiful.